Remember that shepherd’s pie topped with roasted garlic cream cheese mashed potatoes I made last week? It was so good that Mike and I almost inhaled the entire pan in one sitting. As we were eating, I was getting a little worried that we wouldn’t have any leftovers. See, I’m a huge fan of leftovers – especially when you take them and turn them into something else. 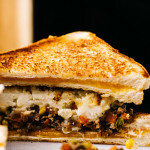 Something else like this insane shepherd’s pie grilled cheese. Yup, I literally put a piece of shepherd’s pie between two(!) grilled cheese sandwiches to make a crazy, carbo-licious sandwich monstrosity. Mike, admittedly was kind of worried. I mean, if I stopped to examine it, I would be too. Let’s be real. It was two grilled cheese sandwiches (v v carb-y) stuffed with even more carbs. Most people are scared of carbs – heck, I’ve been scared of carbs before. I even flirted with going on an Atkins diet. I lasted a couple of days (half a day), but it was pure torture. Especially when going to the bakery. My sister-in-law dragged me there to pick up some bread, but to be honest, I was pretty willing – I was hoping to fill up on the sweet, sweet smell of bread. The smell was intoxicating. There were loaves and loaves of fresh bread perfuming the air with their sweet, delicate scent. While I was busing inhaling and drooling at the same time, my sister-in-law was wandering around, randomly pointing at breads and pastries saying “I hate you, I hate you, I hate you.” Nothing was was sacred from her matter of fact statement of scorn: croissants, danishes, muffins, tarts – even the giant glistening cinnamon buns. It was enough to drive me mad. Turns out she was saying, “I eat you, I eat you, I eat you.” So, um, yeah. My carb-free delirious state altered my hearing somehow (or maybe it was just my bad hearing?). Anyway, after that incident, I’ve never contemplated giving up carbs again. Kim and I celebrated my entering the world of carbs again with a huge cinnamon bun. Don’t worry, we spilt one between the two of us, I didn’t overdose or anything. Now, if I did want to overdose on carbs, I would definitely do it with this sandwich. It’s everything a good sandwich should be: hearty, filling, and a mix of textures and flavors. The crispy-crunch of the grilled cheese and the yield of the mashed potatoes with ground beef contrasted perfectly. This is a extreme sandwich friends, please exercise caution. 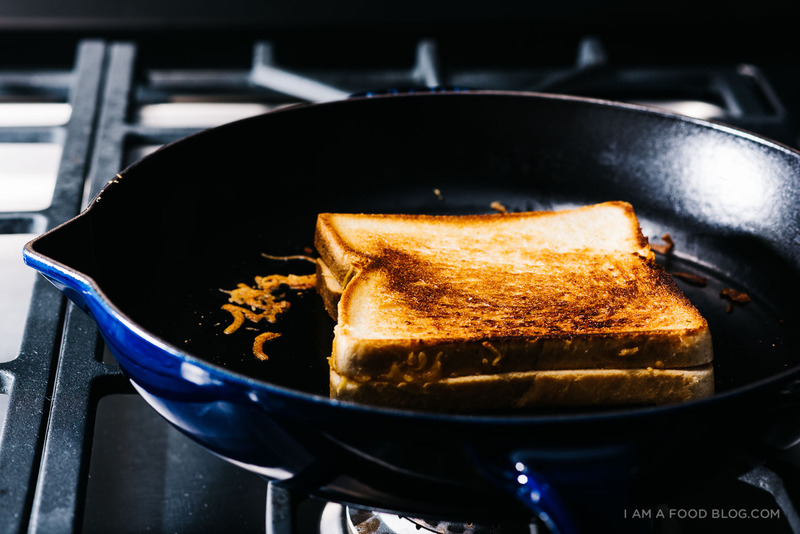 Make two grilled cheese sandwiches as you please. 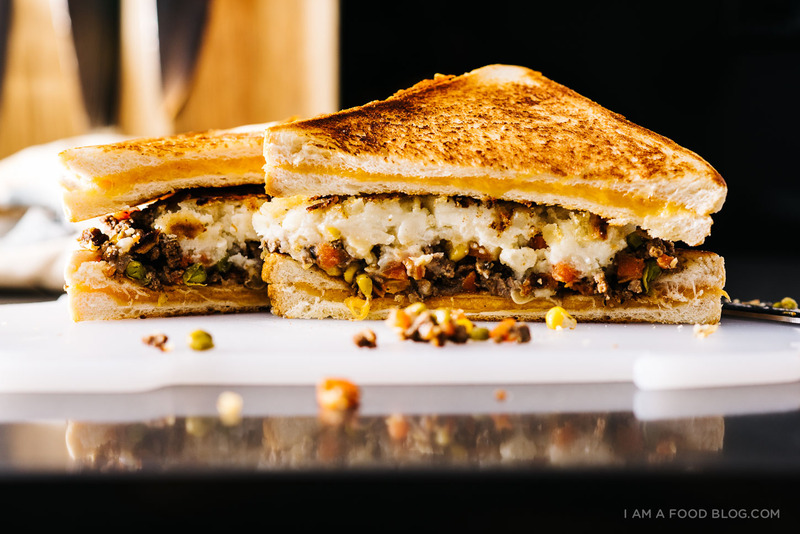 Sandwich your slice of shepherd’s pie inside the two grilled cheese sandwiches. Slice in half and enjoy! PS – Happy St. Paddy’s Day! Hope you’re wearing green and drinking Guinness! Its amazing how good left overs taste when you put them between 2 slices of white bread, especially when the food is a couple of days old and all those amazing flavours have had time to develop. Keep on posting the sandwich recipes, i love em. This is probably THE most amazing edible thing I’ve ever seen. Like, EVER. I mean, SHEPHERDS PIE stuffed between two slices of BREAD with CHEESE?! Genius. Genius. GENIUS. Carbs on carbs is always a good thing. And the bread looks so golden brown and toasty that it’s swoon-worthy, sigh. u have clearly lost your mind. This reminds me of something that would be on Epic Meal Time – and I mean that in the best way possible! It looks so good but soooo bad but soooo horribly good. Aww I hope you feel better!! Now let’s talk about this grilled cheese. Amazing, genius, crazy all in one. I love it. Now that is a good way to use leftovers! This makes me miss my mom – she use to put anything with grilled cheese and it was AWESOME! Thanks for reminding me and thanks for these great photos! 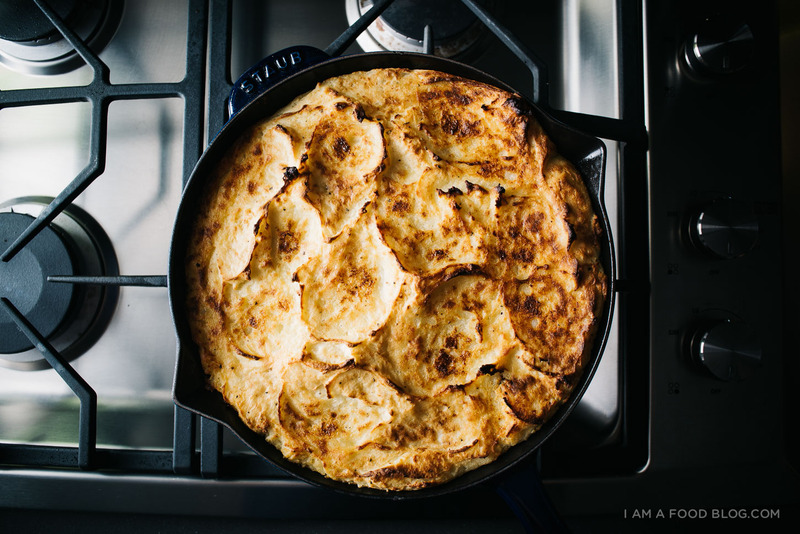 I love this recipe for the same reason I love your blog – you always put your own spin on things regardless of food ‘norms’ (like being to carby!) and each blog post is fun to read and awesomely quirky. Hope you feel better! Oh no the flu!! Hope you feel better soon lady <3 <3 If anything will help, I bet it'd be a big bowl of soup with this insane grilled cheese — this is the TRUE definition of bestovers!! Mad genius. Hope you're getting lots of rest, liquids and TLC <3!! YOU are AMAZING!!!! I love this idea. Very creative and quick. But more importantly DELISH. I am not shouting at you—I am just excited. OMG YUM!!! I just died! This sandwich is perfection! The second I saw the title, my mouth started watering. I’m already hungry and this just made it worse. I’m really considering making this at some point in the very near future. I’m glad I saw this. Now the only problem I face is convincing my mom to let me get the meat for the Shepherd’s Pie because after all, I live with a vegetarian family, so we’ll see. Stephanie, STAHHHHPPPP! Shepherd’s pie on a grilled cheese?!?!?! How do you come up with these amazing creations? I have to make this. This. Looks. Delicious. I need this in my life ASAP.